As significant mathematics errors appear, they will be logged here. Most of the typographical errors (missing/extraneous spaces, mathematics in non-math font, etc.) are not listed. In the proof of Theorem 7.2.11 - The Pigeonhole Principle: The fourth sentence should end with "...form a partition of X." 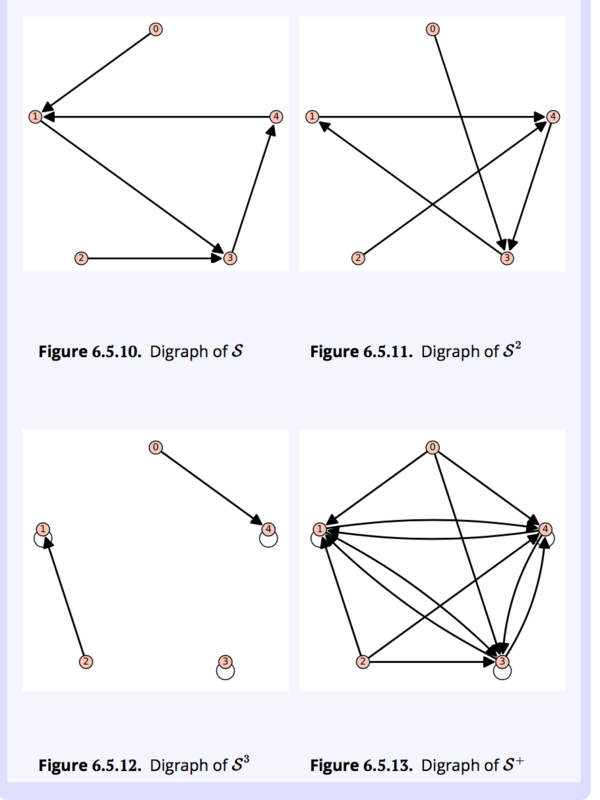 Let \(G=(V,E)\) be a graph of any kind: directed, directed multigraph, or undirected. \(G'=(V',E')\) is a subgraph of \(G\) if \(V' \subseteq V\) and \(e \in E'\) only if \(e \in E\) and the vertices of \(e\) are in \(V'\). You create a subgraph of \(G\) by removing zero or more vertices and all edges that include the removed vertices and then you possibly remove some other edges. If the only removed edges are those that include the removed vertices, then we say that \(G\) is an induced subgraph. Finally, \(G'\) is a spanning subgraph of \(G\) if \(V' = V\), or, in other words, no vertices are removed from \(G\), only edges. Let \([F; +, \cdot ]\) be a field. Polynomial \(f(x)\) is a unit in \(F[x]\) if and only if it is a nonzero constant polynomial.